This is the metallic greyish brown coloured 1987 Visa 11 RE I bought for € 75,00 from its previous owner in Zeist. 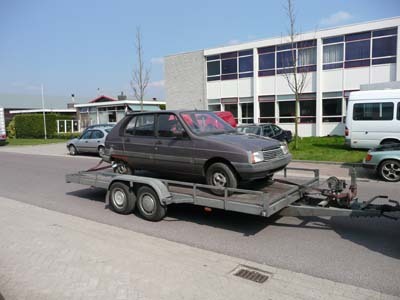 Although it was still in very reasonable condition, I bought it as a donor car for my other 11 RE, the red one undergoing restoration, which needed a lot of parts. The brown 11 RE was perfectly suited to provide these. Left: the brown Visa in Zeist, just after I bought it. A part of the exhaust had come off in France during the previous owner's summer holiday. The trip to my home in Alphen was a very loud one. 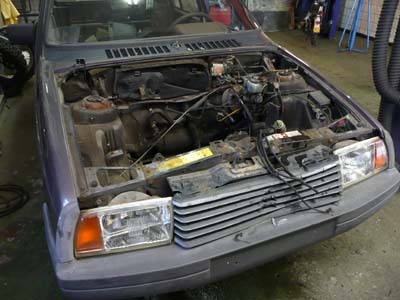 But the engine, having covered 132.000 kms, ran very well, and will therefore go into my red 11 RE (which engine ran less well after 250.000 kms). 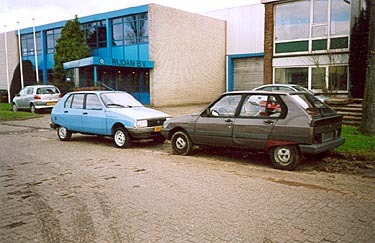 Right: The 11 RE after coming home in Alphen aan den Rijn. Left and right: 11 RE is slightly dented, but most panels are reasonably rust free. Rear wheel arches (and probably more vital parts underneath) have rotted, though. Left: Visas are very conveniant as driving storage for parts. Tail lights immediately went into red Visa. 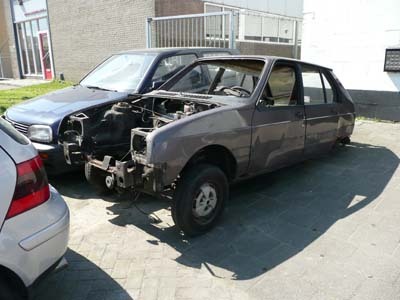 Although not in totally roadworthy condition, the brown 11 RE seemed to be well cared for. The chap who sold it to me said it had always been in the family. The interior (light brown) looks quite good as well, and engine and brakes felt totally reliable. Dismantling it makes me somehow feel sorry, but Visa parts are getting expensive and hard to come by, so scrapping a Visa seems the only economically feasible way to complete the restauration of the red one. Thus the brown Visa will not exactly die, but it will live on in the red Visa. I'll remember it fondly. Polleke paying tribute to the brown Visa, November 2002. The brown Visa gets slowly dismantled. 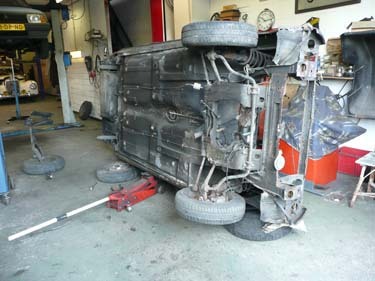 My brother Maarten robbed it of its spare wheel support under the bonnet and its front seats. All were fitted in Maarten's Décapotable Milly. 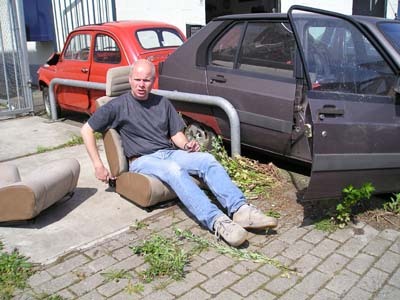 Below, Maarten is testing the seats on comfort. Right: last pieces taken off. Rear suspension proved useful for the blue Visa. Far right: It's all over. The brown Visa waiting for the breaker. Last updated: January 11, 2009.